Norwescon was great. Lovely people, good snacks, cooperative weather. Who could ask for more? I met Katt Leeds (who has amazing oil-painting/reality/portrait skills), and she did a sketch of me in exchange for a copy of Spacetrawler (if you need a portrait commissioned, seriously, consider her). I sat across from Elizabeth Guizzetti, whose e-novel “Other Systems” came out a week ago. She fed me chocolate eggs and then I bought a copy of her book (those two things are not related) (um) (I think). I had a long interesting conversation with Micheal Duquette about art, his sculptures (amazingly made, and out of mostly found objects). Talked “mystery novels” with Vandy Hall (who does lovely drawings, blown glass, and sculpture) and who gave a me a list of detective stories to read (listed below) (I’m very excited to check them out). I also sat across from Vivien Weaver (and her nice friend, whose name I suddenly can’t recall) who had her book “The Wicked Instead” available (which I also look forward to reading). “Cat Who Barks” (can’t find what this might be for)? I’m assuming Shaix sees a green-shifted spectrum. Ha! You totally lost me. What? Coyoty is referencing Lex Luthor and one of his henchmen from the old Superman movie. Lillian Jackson Braun wrote a mystery series with titles that all started, “The Cat Who…”, but none of them included “Barks” in title. @Amy, I’ll bet that’s them. I’ll bet that she said, “‘the cat who’ books.” thank you. Pity, because “Cat Who Barks” is a wonderful book title. And, Lilian Jackson Braun and Nevada Barr are both excellent authors. Also, as soon as Shaix said, “There can be no gain”, I knew that she’d think of a way. Wait… would it be possible to eject planets from GOB control, thereby removing them from the accepted list of targets? Or was this list defined as worlds under GOB control at the time of the declaration? … did humans just get a reputation as galactic troubleshooters? Because I can’t see that ending well for anybody. is that a hybrid moustache and eyebrows? A mousbrow or is it an eyestache? Even in Space they have housing issues. Another band of six humans…. the entire universe is going to be in flames by the end isn’t it? 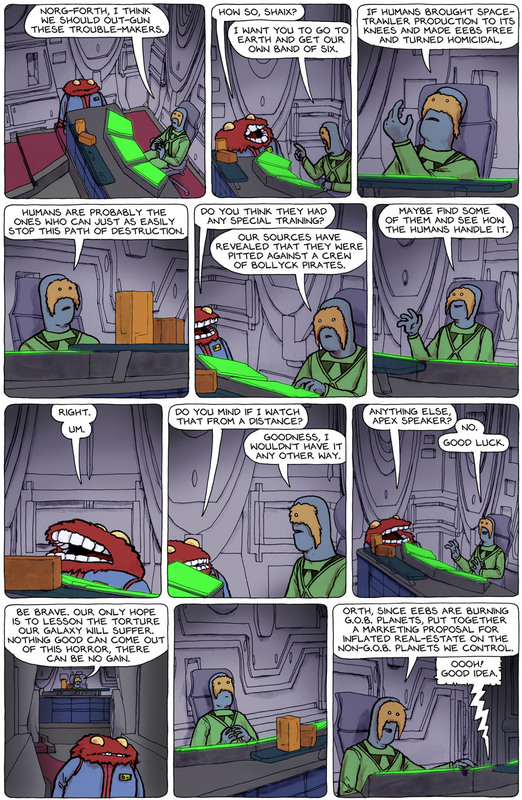 Never noticed it before (and it’s probably way too late to change) but in panel 10 shouldn’t it be “Our only hope is to lessEn the torture out galaxy will suffer”? As in to reduce or diminish the torture of the galaxy, not teach it?